September is apple orchard time! We have an orchard within easy driving distance (about 40 minutes away), that has cider presses and u-pick fruit. Almost every year we choose a Saturday morning in September and head up for some time in the orchard. It is so much fun! This year I'm not planning to can any applesauce, so we will probably make cider, then just pick enough apples to eat fresh. I want to pick a few of several different varieties, so we can have a taste test and see which ones we like the best. Not only that, our only little apple tree FINALLY produced some fruit this year! (We are going on year 6 since it was planted.) However, after bugs, hard winds, and other mishaps, we are down to 2 apples left on the tree. I will let you know how they taste, once we finally pick them! I really enjoy reading books with my kids that fit the season we are experiencing. It makes it all come alive. With that in mind, I hope you enjoy this list of apple books! 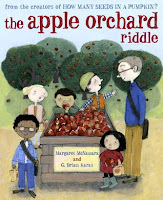 Tara's class takes a field trip to an apple orchard. Her teacher, Mr. Tiffin, asks the class a riddle: "Show me a little red house with no windows and no door, but with a star inside." The class protests that it is unfair, especially since they already have to learn about apples, but their teacher insists. So throughout the day they try to solve the riddle. In the end, it's day-dreamer Tara who comes up with the correct answer, much to her classmates' surprise. The author's blurb in the back mentions that she wanted to explore the idea of different learning styles. I'm not sure I got that from it, except perhaps that Tara's approach to the riddle was quite different from that of her classmates. The riddle was a nice connector between all the bits about apples and the orchard. 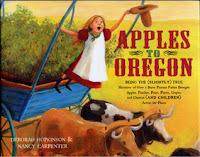 A girl tells the story of how her whole town gets together to pick apples at harvest time. From the very early start, before the sun is even up, to lunchtime under the trees, to a crescent moon punch on a purple ticket, her day is full of hard work and a community that feels like an extended family. 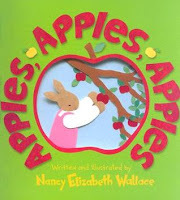 Mama and Papa talk in low voices, and I dream about apples, and dancing, and two half-moons on a purple ticket. She's already dreaming about her next goal! What a hard-working girl! It was a quieter story, but satisfying. The illustrations were soft, with hazy, blended backgrounds and few hard lines. Hedgehog has just finished building her nest under the apple tree, when plop! An apple falls down and sticks to her prickles. Oh no! She tries everything she can think of, including suggestions from her friends, to get that apple off. She won't fit into her nest with it on her back. Each suggestion leads to something else getting stuck on her prickles. Finally, her friend Goat helps her out. A great little cumulative story that my kids have asked for many times. (We own this one!) In addition to the silliness of it, they get a kick out of the ending. I appreciate the rich vocabulary in the text. For instance, Squirrel scurries, Hedgehog patters, the pond water is "murky," and so on. In addition, every new object that sticks to Hedgehog's back is described with 2 different adjectives, such as "crumpled brown leaf" and "small green pear." Mom, Dad, Minna, and Pip take a trip to Long Hill Orchard to pick apples--for pie, crafts, snacking, and for a surprise. Mr. Miller teaches them about apples as they go along. When they return home, it's time for Minna to cook up her surprise! Cut-paper illustrations bring to life the family of bunnies on their apple-picking adventure. There are many individual illustrations that make this a great one for teaching. For example, the endpapers include full-page illustrations of the 4 seasons of an apple tree. 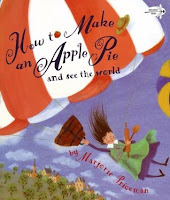 It also includes instructions for making apple prints, plus a recipe (for the surprise! 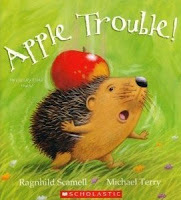 ), apple sayings, and an apple song. 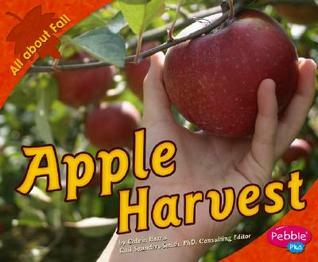 I have used it for teaching preschoolers about fall, seasons, and apples. Loosely based on a true story; told like a tall tale. Many of my Mormon pioneer ancestors came across the plains--though headed to Utah, not Oregon. This version of that trip was entertaining, and I even recognized some of the landmarks along the way. Also, I can appreciate a man so concerned with his plant babies. That there's a true kindred spirit! p.s. I couldn't resist including that subtitle! I have a weakness for long subtitles, and this one should get a prize! 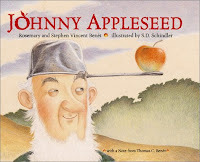 A boy tells about his family's applesauce-making tradition, including buying the apples at the market, bringing them home, and making the sauce. Eating it too, of course. 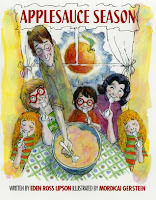 The very last page has the family's applesauce recipe. There's a couple of things I really liked about this book. 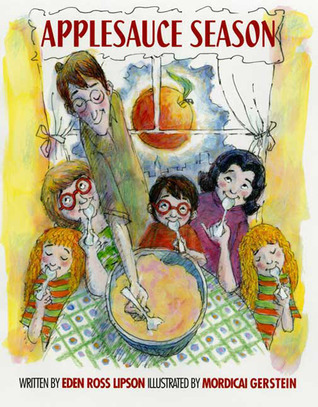 First off, it gave an urban perspective on fall and making applesauce. Many, many books talk about the orchard experience, or picking apples from your own tree, but let's be real here--for most people, this book is probably closer to life. I also liked how it showed the steps to making the recipe, and that it was a family effort. I loved how this family had traditions built around applesauce--how cool is that? In addition, it talked about using different apples as they got ripe, and how that changed the look and taste of the applesauce. This is something I don't usually think about or experience, since I generally make a whole bunch at once and bottle it. It makes me want to try a season of making it fresh regularly! The illustrations were full of warmth. I loved those bright red glasses that connect the generations, and the chicken bowl. 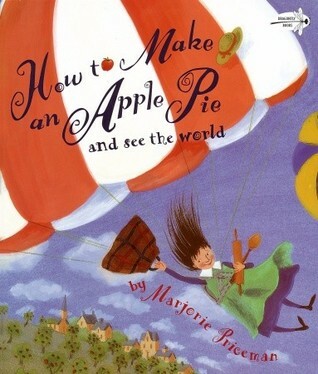 Making an apple pie is easy. You just gather your ingredients, mix them together, bake, and serve. Unless the market is closed. Then you will be off on a whirlwind tour of the globe! 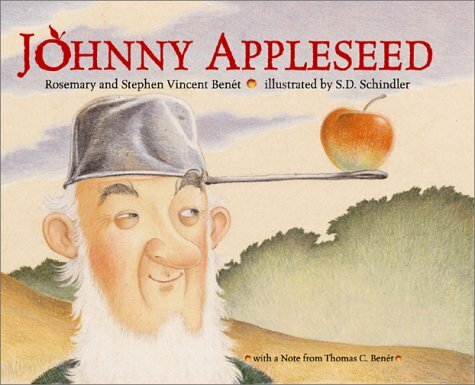 A celebration of the life and times of Johnny Appleseed--or at least, what there is to know about him. This text was a poem that was written in 1933 by the Benets, to honor John Chapman--the man who became known as Johnny Appleseed. Schindler's illustrations added vitality and humor to the poem. Arnold's apple tree is his very own special place. It provides him shelter as he plays in and around it, and gives him apples to eat and decorate in the fall. This one is from 1984, so it has been around for awhile. It's another good one for teaching kiddos, as it showed the apple tree in all 4 seasons throughout the year. Each page had 1-2 simple sentences on it, with text boxes on some pages for more information. 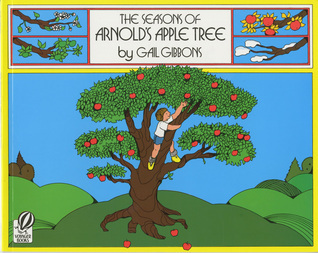 While the Apples, Apples, Apples, book focused in on a fall excursion to the orchard, this one showed Arnold playing in his tree all year. He put up a swing, he built a tree house in it, made a wreath from its spring branches, and even juggled the green apples. Of course, once his apples were ripe he gathered them up and took them home. In the winter he built a snowfort around it. 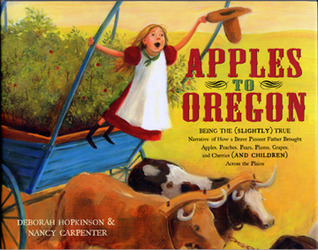 There's a recipe for apple pie included, as well as a page about how a cider press works. The cider press page included a cut-away drawing to illustrate it, which was interesting. 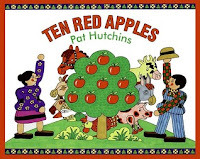 A farmer has 10 red apples on his tree. Each animal on the farm comes by for a snack--will there be any left for the farmer? You practically have to sing this one! While it didn't quite fit the tune of "Fiddle-I-Fee," it was close enough for me to fake it. Each page followed a similar pattern of rhyme and refrain. The bright red apples on the tree, with a number and apples in a row on the top left of each page, made the counting easy for my 4-year-old. The illustrations were not my favorite; everything was drawn to look like those old Fisher-Price farm toys. However, I should mention that my kids didn't seem to mind them at all. I just picked out 2 from the nonfiction section of the library this time, but there were several. Many of them looked pretty similar in content, but there was a good range from easy reader to middle grade. Check in your library's nonfiction section under the 634's and see what you can find! 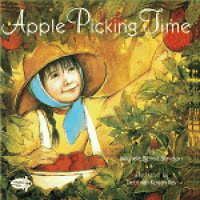 A book for beginning readers, about harvesting apples from an orchard in the fall. Part of the "All About Fall" series put out by Pebble Plus. Each page had 1-2 sentences of very simple text to go along with full color, full page photos. Four sections, including: Fall is Here, Picking Apples, Fun with Apples, and Other Signs of Fall. Also, a glossary at the end, a short list of books under "Read More," and directions on how to use the FactHound website to find other sites. 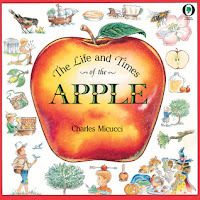 Packed with information about everything from grafting apple trees, to parts of an apple flower, to leading apple growing states and countries. This was a versatile book due to its format. Each 2-page spread was its own section. The left-hand side of the page summarized the information in 2-3 paragraphs. The right-hand side of the page delved into the subject further, with pictures that included detailed labels, some as long as a paragraph themselves. So, when reading it to my preschooler, I only read the shorter page, then mostly just looked at the pictures on the other side. For my 1st grader, we will probably read the entire thing--which at least doubles the length of the book. I could also see picking and choosing certain parts that your child was most interested in to read completely, and leaving the rest. The illustrations are colored drawings, and add a great deal to the information.